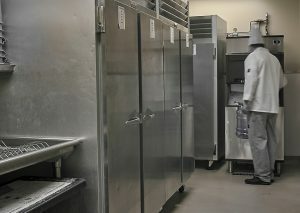 In a commercial kitchen, a refrigerator is an essential piece of equipment. As such, when the refrigerator is having issues cooling it can cause problems for production, business owners, and customers. At Smart Care Equipment Solutions, we understand its importance, and we are here to help! Believe it or not, a refrigerator has many components making up the refrigeration system. As the owner of a commercial appliance, you want your appliance to have a long life span while maintaining energy efficiency. There are a few common issues with commercial refrigerators. First, check that the refrigerator is on, plugged into power, that the circuit breaker is switched on, and that the outlet is providing power to the unit. If all of these things are okay, there may be something else going on and it may require contacting a professional. Compressors – the compressor motor is a vital piece of the refrigeration system and requires a professional technician for troubleshooting. If the compressor is not working, then the refrigerator will not stay cool. Dirt is a common issue with compressors. Most manufacturers recommend cleaning compressors every 90 days to ensure they function correctly. When dirt builds up on the compressor, it begins to run hot, preventing the refrigerator from cooling. If the compressor is clean and has been cleaned regularly but you cannot hear it running, a technician will take a deeper look into the operation of the compressor. Evaporator fans – another essential piece in the refrigeration puzzle. A professional technician will look for ice on the evaporator and verify the drain lines are clear. If the technician finds only part of the evaporator is freezing there could be a low charge or an issue with the fan motor. Temperature issues – if you are experiencing temperature issues there are a couple of things you can check. Your refrigerator should not be placed all the way against the wall. If you do this, it does not allow room for air to circulate properly. When air does not circulate properly, the compressor must work harder which can contribute to premature compressor failure and increased energy use. Another common issue is that the door is not sealing properly. Check door seals and ensure it is closing tightly and seals all the way around. If all of the above appear to be working properly, you may need to call a professional. Condenser coils – much like the compressor the condenser coils need to be cleaned on a regular basis to keep the unit running as it should. Condenser coils typically require professional cleaning to ensure it is done correctly. Water leak – often this is caused by a clogged drain giving excess water nowhere to escape. Make sure your drains are clear, and the water can get out. The evaporator drain pan could be full, the unit may be on uneven flooring, or the room itself could be too hot. Too full – believe it or not having a full refrigerator may not always be a good thing. If you have too much food in your unit, it can block airflow preventing cooling. Too cold – the cooler, the better right? Not always, if you are noticing that there is ice build-up in your fridge, you may have the temperature set too low. If your setting is too low simply adjust the thermostat and see if the problem persists. Ambient temperature – or more simply the temperature of the room your refrigeration unit(s) is in. If things are too hot or humid, the unit may have trouble keeping up as air flows through the coils, compressor, and evaporator fans. A sign of this could be condensation on refrigerated items or in the unit itself. Automatic defrost – if your refrigerator/freezer has an auto defrost function and it is not working efficiently it can cause ice to build up. Auto defrost systems work by the evaporator fans working to cool the condenser coils. The defrost also has a timing system that could need to be replaced. Open door – as simple as it may sound the door being open too often can cause cooling issues. Be mindful of how often you are opening the door, and how long you are keeping it open. This will reduce potential energy loss that may cause problems with the refrigeration cycle. Some units are only designed to open 6-8 times per day. Thermostat – a defective thermostat can cause the coils inside the evaporator to freeze up. With so many components making up your refrigerator, it is easy for something to go wrong. At Smart Care Equipment Solutions we know how vital efficiency in your business is, and we are here to help. From appliance repair to preventive maintenance we have over 500 technicians to help get and keep your commercial kitchen equipment running.